Andres Neumann is an Artistic Curator, Cultural Entrepreneur, Talent Coach and Performing Art’s Manager. He has developed an international reputation as one of Europe’s most innovative professionals in the Arts and Culture. In recent years Andres Neumann has concentrated his interest in creating value and opportunities for Tangible & Intangible, Artistic & Cultural Heritage & Assets, as well as in the developement of global dinamic Strategies, Vision & Mission for the Performing Arts and the Creative & Cultural Industries. In his quality of Artistic Curator and Cultural Entrepreneur, Andres Neumann has arranged the international coproduction network for the original french version of ‘The Mahabharata’ directed by acclaimed and multi award winning director Peter Brook, as well as coproduced three of the pieces the iconic multi award winning german choreographer Pina Bausch has dedicated to the ‘Cities of the World’. Founder and director of Andres Neumann International, he has delivered high quality and cutting edge arts and entertainment big events worldwide for more then 25 years. The longtime cooperation of Andres Neumann with artist’s such as Peter Brook, Pina Bausch, Andrzej Wajda, Ingmar Bergman, Tadeusz Kantor, Dario Fo, Vittorio Gassman, Marcello Mastroianni, have marked him deeply. Jack Lang, France’s longtime Minister of Culture, Luigi Nono, the most prominent italian composers of the 20th century, and Renato Nicolini, longtime Secretary of Culture of the City of Rome, have been his mentors. Andres Neumann has been ordered Officier de l’Ordre des Arts et des Lettres by the French Government for his significant contribution to the propagation of French arts and culture in the World. The professional Archives and Legacy of Andres Neumann have been donated to the Funaro – Cultural Center in Pistoia (Tuscany). They have been declared of national interest by the Ministry of Cultural Heritage, Activities and Tourism of Italy. 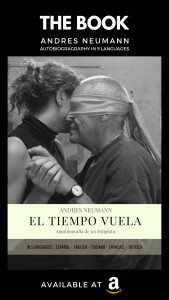 Andres Neumann has been a key player of the worldwide cultural renewal after the May 1968 Events in France. Storytelling, Narrating and Comunicating the creative process in the fields of Art & Culture through the Social Media is his main research at this moment.